Paroi Munchen scores 3 goals in the first half and as usual the late scorer oliver neuville add another goal in minute 79'. Top scorer Akmal scores one goal in minute 42 to make it 3-0 in the first half after Roberto Carlos and Roy Keane put Paroi Munchen a head in the minute 12' and 23'. In total, Akmal score 14 goals after 14 games in the 4th Division group 544. 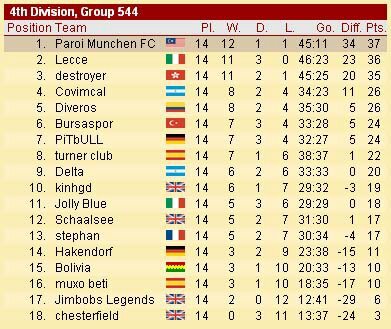 Paroi Munchen leads 1 point from his unbeaten opponent in the 2nd place Lecce. 3 more games to end this league. Paroi Munchen will meet Lecce on January 14, 2006. Tonight Paroi Munchen have a match with chesterfield. The result will be updated tomorrow.